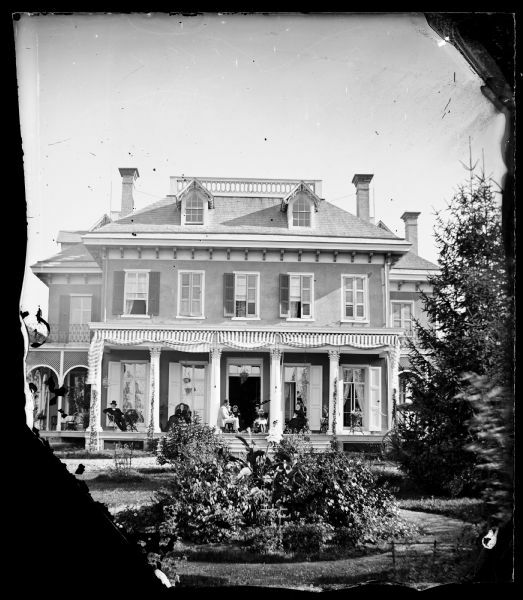 Home of Governor Cadwallader C. Washburn on Monroe Street at the east end of what is now the Edgewood College campus. Washburn is probably the man at left. Governor Washburn purchased the home from Samuel and Emma Marshall on September 17, 1873 for $15,000, when he was finishing his one term as governor of Wisconsin. Samuel Marshall, co-founder with Charles Ilsley of the State Bank of Madison, had purchased the partially-built house from John W. Ashmead. Governor Washburn gave the property to the Dominican Sisters, who established an academy, the basis of Edgewood College.